Why we work the way we do, what other people do and different schools of thought. It’s a hot topic in the studio right now! At 2020 we offer photography, design and print, and output across the whole digital and print spectrum. This means we are constantly using both colour formats and in turn talking about how they relate to one another, conversion, and the results they produce. These discussions led to the blog you are now reading. A bit of background first. For all the people out there who don’t have the foggiest what we’re talking about, I’ll try and keep this simple! Which stands for Red, Green and Blue. This is the go to colour format for anything digital or screen based. This is because screens give out light in these three colours and use them to the create the vast spectrum of colours you are seeing in front of you now. Red, green, and blue are the “additive colors ” – as you can see from the image if you combine red, green and blue light, you get white light. Is the colour space that printers use. It’s made up of Cyan, Magenta, Yellow and Black. The reason black is referred to as K is two fold. When printing plates are used black is the “Key” plate that gives the image definition. It is also the last letter of black and B isn’t used to avoid confusion with blue. 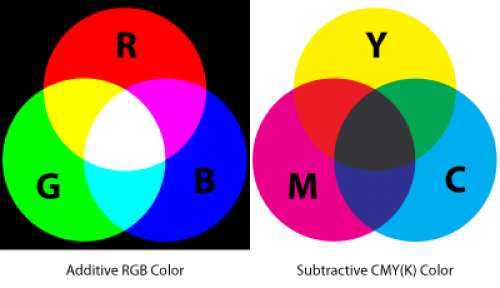 Cyan, magenta and yellow are “subtractive colors” – if you print cyan, magenta and yellow inks on top of one another, they ought to absorb all the light thrown on them. Your eye should receive no reflected light from the paper and perceive black. Well thats what should happen but because of impurities in inks you need a black or key ink is added to bring out definition and get a true black. 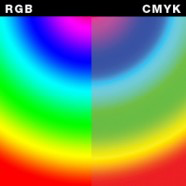 Looking at the above image you will notice that RGB can be seen within CMYK spectrum and vice versa. Similarly to the impurities of black ink all digital screens will be calibrated slightly differently, meaning that what is supposed to be exactly the same colour may appear slightly differently from screen to screen. Which leads us to the important issue of calibrated screen, you would be amazed at how differently the same image can appear on different screens. At 2020 we use the latest calibration equipment to ensure all of our screens show the correct colour across the board. This article by Andrew Kelsall, makes for very interesting reading as he is advocating designing in RGB, which is standard for the web, but more unusual for print. He does make some very valid points and the discussion that follows covers this topic comprehensively with opinions of people who are involved in the industry have a read here. Colour and imagery are at the heart of everything we do here, so this is a really important subject for us. We hope you’ve learnt something, and please get in touch if you would like to know more. We would love to flex our CMYK muscles and do some print for your next brochure. Or let us use our skills in RGB to produce some photos for your website! To discuss any of this futher please give us a ring on 0113 272 0277.